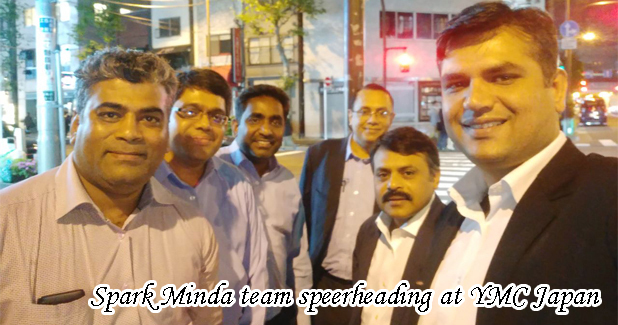 Spark Minda, Ashok Minda Group participated in ‘Technology Exchange Meeting’ at Yamaha Motors Co (YMC) Japan during 'Global Supplier’s Conference 2018’ that was held at Shizuoka, Japan on April 25-26, 2018. As part of initiative, Spark Minda was invited to showcased and demonstrate latest technological products and unique capabilities during the Technical Exchange Meeting. The event provided an opportunity to demonstrate relevant and innovative products, tools and capabilities to Yamaha’s employees and leadership. It will also open up avenues for future partnerships. A total of 21 suppliers participated in the Technology Exchange Meeting. Some of the Indian companies who participated were Minda Industries Limited, Fiem, Gabriel, Advik, Endurance, Shriram Pistons, Emitec, Sansera Engineering etc. There was a high interest from all participants and visitors during this event. During this two day conference, the Group had the opportunity not only in terms of brand visibility, but also to connect to various audiences on specific subjects in the field of ‘Innovations & Advance Technology'. It gave an excellent platform to the organisation to showcase and demonstrate its products and processes which mutually benefits and brings in knowledge sharing, technology transfer and product familiarisation among Yamaha engineers. From Spark Minda, Ashok Minda Group, the Business Group Companies that participated and showcased products at stall were Minda Corporation Ltd - Security Systems Division, Minda Stoneridge Instruments Ltd, Minda SAI Ltd along with Component Division, and Spark Minda Technical Centre (SMIT), EI Labs. On display were products on the following three themes: solutions for electric vehicles, new technology products and environment protection.